The Duke and Duchess of Cambridge welcomed a baby boy into the royal family on Monday evening. Dan appeared on Nightline last night to discuss the exciting implications of the new arrival. Dan says, “As the little prince lies in the Lindo Wing of the St. Mary’s hospital in London, he has no idea of the royal life that awaits him as heir to the nearly hundred year old House of Windsor, celebrity responsibility, and the privilege of his position. 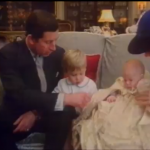 Growing up royal, it’s no reality show; it might not even seem real. But when you’re the Prince of Cambridge, it’s your life. And it includes some pretty spectacular perks. First, there are the homes, plural.” To find out what else, watch the full episode here.